Sono Global recently acquired the Cajuba juice production facility at Nova Soure in Bahia, Brazil with a view to complementing and increasing its product range. The plant has the capacity to produce both FCOJ and Tropical juices (including passion fruit, mango and acerola, amongst others). Following a downturn in the plant’s fortunes due to funding problems and lack of access to the key markets, Sono Global stepped in and acquired the company back in July 2016. This was part of their strategy of adding another key link in the integrated supply chain that Sono Global are pioneering in the fruit juice industry through the introduction of a business model that has been so successful in other commodities such as oil. Fruit Juice Focus talks with three of the principles of Sono Global: Frank Runge, Darren Jenkins (CEO) and Richard Malpass. Sono Global (SG): Sono was formed in 2010 with the objective of becoming an integrated fruit juice production and distribution business, focusing on our first production plant in Ghana. From that initial business the group has developed to the point where we now have two production units, a distribution and packaging solutions business, Maia, and two trading arms, Steinhauser in the US and Sono Bv in Europe. FJF: You purchased a production facility in Brazil in July last year. How did this come about? SG: We are always looking for production assets in prime locations to expand the range of products that we can supply to our customers. We have been aware of the plant in Brazil for some time and its excellent access to a wide range of tropical and citrus fruits. As the plant was part of a larger group which was in Administration the challenge was to find a way of acquiring the plant from the authorities. This was a very complex process and took far longer than we expected. FJF: What were the reasons behind the failure of the Cajuba operation before the acquisition? SG: The world of banking for a commodity our size has changed quite dramatically. In the recent past the agricultural banks were comfortable with financing this (Cajuba) type of business and the various seasonal fluctuations that went with them. But after the banking crisis the majority of these banks decided to restructure with the aim of looking to invest in commodities that were far greater than the citrus industry. So for Cajuba they were falling unfortunately into the bracket of being too small for one and then too big for the tier below and so the business ultimately failed. However it must be noted that this was not due to the orange juice side of the operation, as that is actually a fairly standardised and commoditised business, but it was on the tropicals side of the business that the funding became an issue. The tropical fruits are very expensive and you require an awful lot of financing to fund the cash flow requirements at peak times when they come into season. 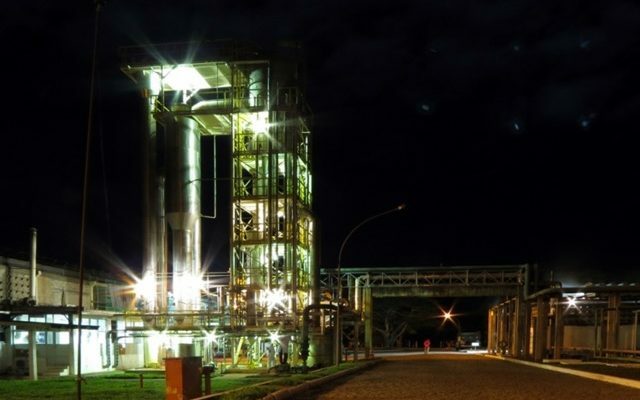 The Cajuba plant is an integrated plant where you need both critrus and tropical to work simultaneously. You can’t switch a plant like this on with just the tropicals and then not run the orange line and vice versa, you need both as a contributor to the fixed cost. They might not make the margins or the profit at the same time but you need to run them both simultaneously. The other problem was that this was a very Brazilian inwardly looking organisation and they didn’t have access to the European and US export markets for tropical products leaving it stuck in a trap in terms of market. FJF: Had the plant ceased operations when Sono took over? SG: It wasn’t quite ‘mothballed’ but it was in a state where it needed a fair bit of refurbishment to get it up and running again. FJF: How long had the plant been operating before you purchased it? SG: The original plant had been producing juices and concentrates since the early 1970s including cashew, mango, passion fruit, acerola and guava. FJF: Were you able to get any local government support or aid to help get the plant up and running? SG: No. We’ve learned from having our first plant in Ghana (Africa) not to rely on government aid or grants. They may come later. People are very happy that we are here in Brazil and providing a welcome boost to the local economy but this has not translated into any offers of financial support or investment. FJF: Are you able to say how much Sono invested in the purchase? SG: This is confidential information although part of the information is available from the public records office in Brazil but this doesn’t give the complete picture. FJF: How many people does the plant employ? SG: The plan is to bring the workforce up to about 180 employees when we are fully up and running and bringing on different fruits at different times. At the moment we employ around 120 staff. FJF: There has been much talk over the past decade of juice traders being squeezed on price by both the big producers and the big global supermarkets. Was this part of your reason to get into production? SG: We have always been a producer of juice, which also trades a number of other products. Our plan is to sell more and more of our own production. This gives us control of the whole supply chain which for many of our customers is becoming a key issue. FJF: This strategy of controlling the whole supply chain is an interesting one and quite new to the fruit juice industry. How have you developed this for Sono? SG: We (Darren and Frank) and a lot of the other investors come historically from an oil background where integrated chains were created as early as the eighties and the nineties. In the business that we are finding ourselves here there are very few players who have an integrated chain. You have got the brands whether they are supermarkets or just big brands on the one side who don’t really look for an integrated chain. They just make sure they have got the right quality at the right price point at the right delivery point throughout the year. And then you’ve got the super-producers who again don’t really go down this integrated route either, and in-between you have the people who do the infrastructure – the shipping industry, the warehouse industry. But somebody who really goes from field to shelf is very very rare in this sector. We are working to overlay and map out a process that works for another commodity such as oil into the fruit juice industry. So far so good. People are ultimately interested more and more in having security but not ownership or control over the food that they process. So if you are a brand that would like to have an integrated chain but are not in a position to do so for whatever reason, their business model may not allow it or for reasons of the size of their company they can’t develop the chain scenario. But they like the principle and security of whole integrated chain – and that’s where we at Sono come in. Our model aims to control the agricultural asset and deliver that security to the end user. They want to know where their crops are grown, they want to know who the farmer is and they want to know who the people are that are picking it and to know they are being paid properly and they are paying their taxes and they have healthcare and all those things but they don’t want to own the asset to give them that security. FJF: Why did you choose to invest in the Brazilian industry? SG: We invested in Brazil simply because of the access it provides us to high value tropical products, such as acerola and passion fruit. FJF: Do Sono Global own plantations in addition to the production plant? SG: We currently do not own plantations, however in the correct circumstances we would not rule this out. Our current model is to contract grow many of our crops. For instance in Ghana we are currently contract growing 15,000MT of MD2 pineapple which the Pinora plant will process. FJF: What might the correct circumstances be? SG: It is difficult to predict at this stage in our development. It is a huge outlay of capital. Owning land is not the expensive part as we have figured out. It is the irrigation and the plantation, so it becomes a different pot of money that would seek to invest in owning a plantation. At present we give plantations the outlet. If you grow it we will be there with the plant and convert it into another commodity. We prefer a relationship with a farmer, who is near to us, where we have a certain dependency on each other. We do a longer term joint venture or growing deal with them as we are not the agronomist, they are. We see no added benefit in owning a piece of land and doing the agronomy ourselves because none of us are agronomists and that is not our focus. FJF: What, if any, have been the main obstacles you have faced so far with the facility? And how were these overcome? SG: We have not faced any unforeseen obstacles with the plant to-date. We had sufficient time to plan the process with our excellent management team on site and we are delighted the project has run very efficiently so far. FJF: Have you kept the local management team in place or have you had to draft in your own people to get the plant up and running? SG: From the 180 people that we will have in place when we are fully operational there would be most likely 90 of the original staff, and yes it’s on the management side that we have made changes to the workforce. You just can’t all of a sudden find a workforce locally that is qualified to transform the operation to the level and standards we require. So we brought over key personnel from the management team running our African plant where we spent a time and resource getting that up to speed and working perfectly. Now we are using this expertise in the Brazilian operation. We have a technical guru who has gone into Brazil and done all the work that was needed to get the plant up to the level that it is now so we can confidently produce all of the juice that the plant allows us to. FJF: Were there any issues with quality certification standards and laboratory facilities? SG: The plant had all of the normal certificates beforehand, BRC (British Retail Consortium) and so on and we are just going through the process now of reinstating everything because it is effectively a new plant. There are two great labs on site which have been refurbished and brought up-to-date so we are basically self-contained in that respect. FJF: Are there any specific directions that you hope to take the Cajuba plant in? SG: We are seeking to develop the Agro supply base around the Cajuba plant in the coming years, with a view to having around half of our fruit contract grown in the next five years. It is also our intention to develop the volume for organic fruit we process at the plant. In our Ghana plant 39% of the fruit we process is organic or Fairtrade. FJF: With regards sustainability, do you plan to introduce the support initiatives of the local farmers with farm school programmes similar to those you run in the African plant? SG: Yes we do. Although the position in Brazil is slightly different. In Ghana, we still run these programmes and there we have now educated some 2500 farmers who we have put through a six course module on everything from planting to pruning, weeding to spraying, and given them log books, and undertaken practical as well as theoretical work with them. We have a background in providing that level of educational support to our farmers. It is essential because otherwise the quality of the fruit that we get delivered is too poor. In Brazil they are slightly further ahead in sophistication but we have contracted an agronomist to work with the Cajuba plant because there may be different things that for certain markets we have to control to ensure that the organic chain remains intact, such as the level of pesticide for example. And for that you need an agronomist who can provide schooling for the farmers to help them understand that there is an additional value to them if they control their crop better. FJF: Could you give some capacity information on the plant and also the varieties of juice you plan to produce? SG: The plant has four lines in total, one running orange products, the remaining three focusing on tropical fruit. The plant is able to process approximately 100,000 tonnes of fruit a year. The main products are frozen concentrated orange juice and cold pressed oil, passion fruit juice, acerola Juice, mango Juice, cashew Juice as well as a variety of other locally consumed products. These juices can be produced as either cloudy or clarified, and we have the ability to run purees and puree concentrates as well. The plant itself is very versatile which is one of the reasons it’s so attractive. FJF: In addition to the fruit processing facilities at the plant do you have packaging facilities on site? SG: We pack into drums and bins. When we bought the plant there was a tetra pack line there – it was a pretty old line and we had no intention of using it. It’s not our model – we are simply bulk producers of bulk juices. We leave it to the experts to bottle and pack it. FJF: In terms of location, is the plant in a good location to serve both the local and international markets. Is it near good road, rail and ports? SG: A bit challenged with regards the railways! And it is not exactly close to the port but there is a reasonable road network. This is the sort of thing you learn when you start working in countries like Brazil. 400km for most people in Brazil is like a walk in the park, but it’s still a very long ride in a lorry pulling a container of juice, but it’s perfectly ok, perfectly manageable. The key is that the plant is right bang in the middle of the agricultural area. If you bear in mind that we are making concentrated juices and normally moving ten times more fruit than we are when producing juice it is more important to be close to the fruit! FJF: Which destination markets are you targeting? SG: Primarily we are targeting the European and US markets and the local markets where appropriate. FJF: What do you see as the key consumer juice trends in the medium term? And how do you plan to address these? SG: There is a continual trend towards cold pressed juice and puree, and the use of vegetable juices in blends will continue to grow as the focus on the negative issues around sugar intake continue. We see organic products continuing to grow in the medium term. To meet these demands its more about having the right Agro supply chain to support these demands, which we have available to us in both of our production locations. FJF: Are the trends global or do they differ in the various markets you operate in? SG: They are basically trends in the high value markets. Cold pressed juices are too expensive for more normal people to be able to buy so they are very much an American and European trend. You certainly don’t see that kind of demand in other parts of the world. FJF: Is demand for organic and Fairtrade products on the increase from your customers? SG: The market leader is Europe, followed by the US with more and more interest in the US. People locally don’t really value it because they see the fruit which is growing on their doorstep so there is no premium for it in the local market. FJF: Are you looking at any other acquisitions/mergers in 2017 and beyond? If so, in which markets? SG: In the coming year we are going through a short period of consolidation, whilst we put all of our business units on to an integrated ERP (Enterprise Resource Planning) system. The ERP system understands what the demand is and does all of the maths relating to this. It’s basically an accounting system. We are however still investing in our businesses, for instance in Ghana we are installing a cold pressed oil facility to extract further value from the process. We are also installing a Solar park at this plant to reduce costs and improve our CO2 footprint. One of the attractions of the Brazilian acquisition was the wide range of premium products that we can now get involved in. Clarification of juices is another key thing for us going forward. Our ability to clarify high end products is a valuable piece of the jigsaw for us. Sono Global plans to be the go-to company for those who have a demand for clarified juice products. The Quality Juice Foundation aims at improving all aspects of the quality, safety and image of fruit juices and fruit juice containing drinks. To support these aims one of QJF’s initiatives is the annual Quality Juice Award that honors and recognizes excellence in the area of legal, analytical and technological research work and furthers the development of the positive and healthy image of fruit juices. The award presentation will take place in October 2017 in Antwerp as part of the Global Juice Summit 2017 – the yearly event for the fruit juice industry. The award winner will have the opportunity to give a short presentation on his/her research work at the event. If you are about to or if you have recently published a fruit juice related scientific paper or thesis regarding the improvement of quality, safety and image of fruit juices, please send your application by 30 June 2017 to info@qualityjuice.org or through the website http://www.qualityjuice.org/. The award winner will receive prize money amounting to 2500 EUR. This, the second IFU Technical Workshop, takes place in Valencia in Spain on the 28th March 2017. As the trade of blood orange juice and concentrates depends on their colour intensity, a unique and internationally accepted method for measuring their total concentration has been developed by the IFU. It provides an analytical technique that can be used by both processors of blood orange juices and purchasers (such as bottlers) as a standard way of establishing specifications that does not rely on arbitrary visual appearance. It is a useful tool to avoid conflict between buyers and sellers. Launched in February this year, IFU method #83 Colour measurement in blood orange juices has been developed in-house by its Methods of Analysis (MAC) laboratory. The colour of pigmented “blood” oranges is caused by the presence of anthocyanins. Cyanidin-3-glucoside is the main anthocyanin pigment seen in oranges with lower concentrations of other mono- and di-glycosides anthocyanins. The total concentration of the anthocyanin pigments varies depending on the variety concerned and seasonal climatic influences. The method works on the principle that anthocyanins pigments are completely extracted from the juice with a specified volume of acidified methanol. After centrifugation the pigment content is determined by measuring the extract’s absorbance at 530 nm against a solvent blank. The method requires the use of a spectrophotometer capable of measuring at a wavelength of 530 nm, a centrifuge with sufficient speed to give a “g” force of 3000 g and other equipment and solutions typically found in a juice operational laboratory. The method say the IFU has taken three years to develop and was validated in 2016 with 18 participating international laboratories using blood orange samples. The objective of the ASIA Road Show is to connect with Asian fruit juice producers, to explain the control activities of SGF, the international organization based in Germany responsible for raw material control that aims to assure the safety, quality, authenticity and sustainability of juices. Participants will have the opportunity to discuss issues related to the juice industry with the relevant speakers. The IFU, as the Global Juice Association, will present its activities for the juice industry. The IFU as the only official juice NGO at Codex Alimentarius will explain the positions adopted in response to the development of international Codex standards. IFU will describe the current catalogue of analytical methods, method developments and the benefits of IFU methods for international trade as they are recognised in the Codex standard. The seminars are intended for quality, R&D and production managers, as well as for purchasing and sales managers of juice processing and bottling industries, plus laboratories, state control inspectors and research and development institutions. The market for organic fruit juices in the Nordic region is on fire. There is huge awareness and demand at present and growth shows no signs of slowing down. In Sweden the organic market grew by 25% in 2015 and in Finland growth levels were at 12% whereas the conventional groceries market in Finland managed only 0.3% growth in the same period according to the Finnish Organic Food Association. 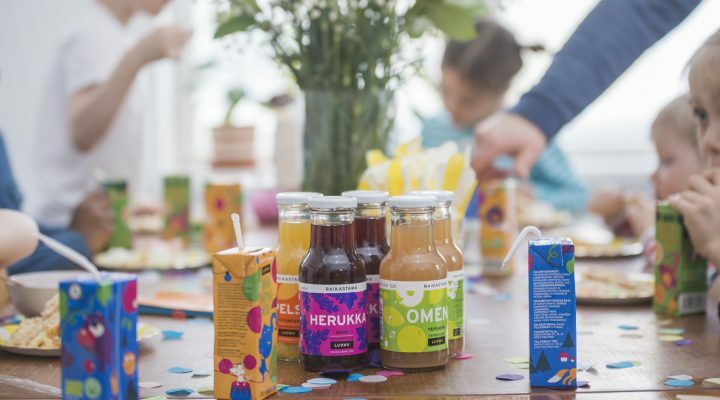 Raikastamo are one of Finland’s leading organic fruit juice producers and their products can now be spotted in the best cafes and shops across Finland and neighbouring Nordic countries. Fruit Juice Focus (FJF): Can you tell us a little bit about your company and why you entered the organic fruit juice market? Jyri Kähönen (JK): Raikastamo got started from very small beginnings – we were six friends who started pressing apple juice from an apple orchard in Southern Finland. We were lucky to win the prize for the Best Finnish Organic Product in our first year of operation. That’s when things got rolling. At the moment we are growing fast – now we are operating in three categories in premium organic bottled juice drinks for HoReCa, children’s organic juice drinks and organic carbonated sodas. During 2017 we will launch a range of 1 litre organic juice drinks for the retail market and a new craft soda brand. We have achieved a steady foothold in the Finnish retail market and are in the process of expanding to other Nordic markets. In the international market we operate under brand name Freshery. The organic market provided us a point of entry to the market as a whole. There was still space for a small organic player such as ourselves between the big established players like Valio, Refresco Finland and Eckes-Granini. Also the Minimum Order Quantities (MOQs) for organic ingredients are usually much smaller than for conventional products. That enabled us to source from the global market in the first place – the minimum quantities for conventional products would have been overwhelming for us in the beginning. FJF: How do you as a company and your products achieve organic status? Is there a certification process? JK: The organic certification process is strict. It is supervised by the national and EU supervision authorities. In Finland the certification is granted by The Finnish Food Safety Authority and the licence is audited annually. The Finnish Customs run random laboratory tests on a regular basis to check for traces of pesticides and other forbidden ingredients from the raw materials we use and the finished products we sell. FJF: How and where do you source your organic raw materials, or do you grow them yourselves? Can supply keep up with demand? JK: The Finnish domestic supply does not satisfy our need. We are also operating with citrus and other more exotic fruits for which there is no supply from the local market. We source our supply from the global market via agents and also directly from the supplier of the raw materials. The annual alternation of the crop levels in organic farming is much more volatile than in conventional farming because of the smaller scale and because no pesticides or fertilizers are allowed which means that we have to be constantly reviewing our sources of supply. So far we have been able to satisfy our needs but as we are expanding we might face challenges in the future on that side as well. FJF: What challenges has your company faced and how have you been able to overcome them? JK: The awareness for organic products in the Nordic market is on a good level. Luckily the days when it was necessary to educate or convince the consumers are over. Now we are able to focus on developing our brand and sales in a far more receptive market. The big question with the retailers is always the price point. The organic ingredients and raw materials bear a higher price in comparison with conventional ingredients and raw materials and that, naturally, has an effect on the consumer price point as well. The only way to justify the higher price point is to focus on quality and the strong brand. From the beginning we have considered marketing as our core competence. In our team we have a television commercial director and an industrial designer, and one of the founding partners was a director for consumer experience in a major IT company. Therefore we had a strong orientation on marketing and brand building from the onset. I believe that is what differentiated us from the other small, production-orientated players. FJF: How do you see the organic market developing, and you as a company within the organic space? JK: As a small, growing company we plan to work market by market. At the moment we are focusing on the Nordic market. There is still plenty of work and room for development for us here. Having said that, we are always open to discussion if the right distributor should walk in from some other territory. 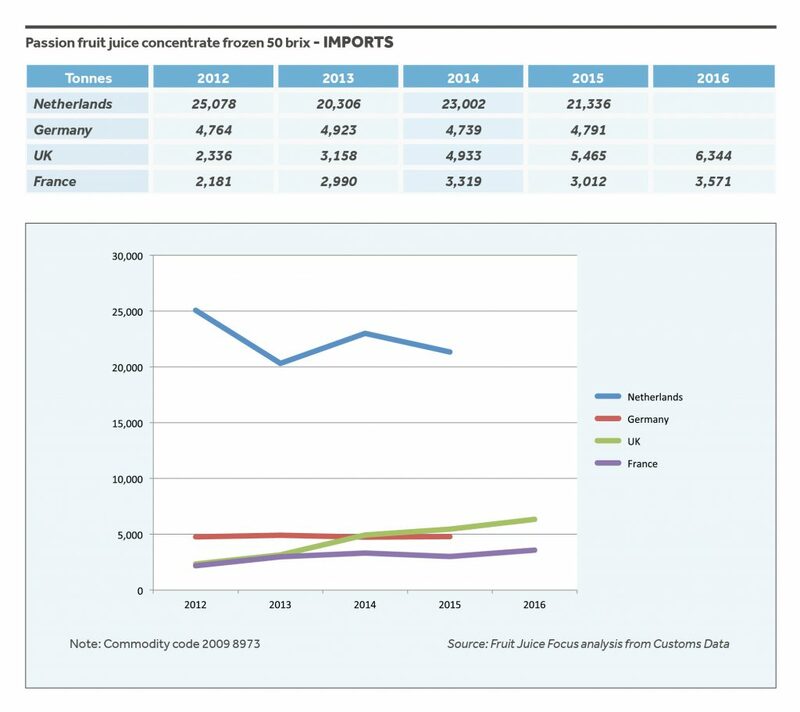 Fruit Juice Focus analyses the past five years of imports of mango and passion fruit juice concentrates into key consumer countries including the Netherlands, Germany, France, the UK and the US. 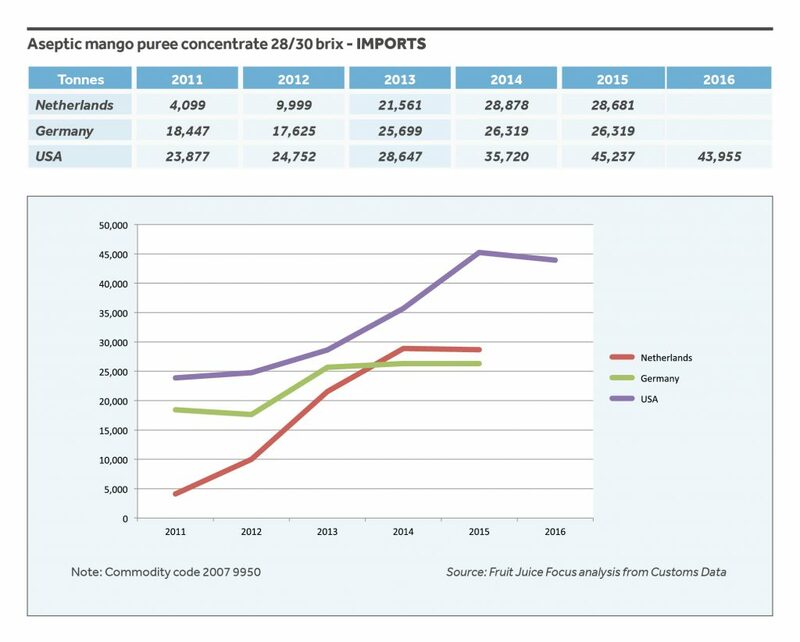 Aseptic mango puree concentrate 28/30 brix imports have shown steady growth in the three countries analysed below with all showing a surge in demand between 2011 and 2014. While figures indicate a levelling off in 2015 and 2016, the increased popularity of mango juice over the last few years can’t be ignored. Tropical blends on the supermarket shelves are commanding more space as consumers look to expand tastes. Imports into the Netherlands, for example, more than doubled in 2012 against 2011 with an even greater jump in 2013 up to 21,561 tonnes against the 2012 figure of 9,999 tonnes. Imports into the US have increased steadily from 2011 through to 2015 with 2016 showing a slight drop in demand of around 3%. Most of these supplies would have been delivered from South America – particularly Colombia. Imports of passion fruit juice concentrate (50 brix) show steady growth in the UK and France for the period 2012 though to 2016. The sporadic supply to the Netherlands could be attributed to the volatile pricing that the passion fruit juice concentrate market is subject to. Production in top-producer, Ecuador, rises and falls corresponding to local fruit pricing – usually in a three-year cycle. Passion fruit juice concentrate has traded for up to USD15000 in the past few years. Current pricing is around USD7000/tonne. As part of the Brazilian industry’s commitment to transparency CitrusBR has reported that global inventories of Brazilian orange juice (FCOJ equivalent) as of 31 December 2016 amounted to 497 383 tonnes. This is a 32% decrease on the 728 865 tonnes on hand the year before. The association has also projected that global stock levels of Brazilian FCOJ would fall to just 70 000 tonnes on 30 June 2017. This would represent an 80% drop on the 351 567 tonnes carried into the 2016/17 crop on 30 June 2016. The February 2017 Fundecitrus forecast for orange production for the 2016/17 season in Brazil (São Paulo and West-Southwest Minas Gerais citrus belt) is 244 million boxes (40.8 kg) – unchanged on the December 2016 projection. The number of fruits per box has decreased due to the increase in the weight of the fruits caused by heavy rains since December. The average fruit droppage rate for all varieties remains at 13.73%. In the face of a small crop, the demand for fruit has boosted the harvesting pace, which has helped maintain low droppage rates. Production and processing: Frozen concentrated orange juice (FCOJ) production for 2016/17 (November 2016 through October 2017) is forecast to increase with expected strong demand from processors due to attractive orange juice futures prices. Estimated 2016/17 orange juice production is 170,000 tonnes (65 brix), with production from 2015/16 revised upward to 165,000 tonnes. Deliveries to processors in 2014/15 were also revised upward. The initial forecast for fruit use by processors in 2016/17 is 1.70 million tonnes, compared with 1.60 million tonnes in 2015/16 and 1.55 million tonnes in 2014/15. Trade: Estimated trade volume forecasts for exports of orange juice in 2016/17 are 163,000 tonnes. 2014/15 and 2015/16 estimates are revised upwards. Exports of orange juice to the US in 2016/17 are expected to be the same as in 2015/16. Processing: Spain is preliminarily forecast to process 900,700 tonnes of oranges in 2016/17. This will equate to 70,000 tonnes of concentrate. The 2015/16 crop reached 728,000 tonnes producing 56,000 tonnes of concentrate – up on the 820,000 tonnes (64,000 tonnes of concentrate) produced the previous year. The total volume of oranges channelled to processing depends on crop quality and quantity of oranges destined for the fresh market, both domestic and foreign. Production: Estimated orange juice production in 2016/17 (October-September) is 42,000 tonnes, over 8% down on 2015/16. Consumption: Forecasts for 2016/17 orange juice domestic consumption down 12% on 2015/16 at 72,700 tonnes, with demand for juice beverages losing momentum since 2014. Key industry contacts agree that although demand for juice from concentrate is falling, the market for 100% fresh orange juice is growing as cold-chain infrastructure, marketing efforts and disposable incomes expand. Trade: With the expected drop in overall consumption, forecasts for orange juice imports in 2016/17 are 33,000 tonnes, a drop of 18% on 2015/16. Forecasts for 2016/17 orange juice exports are also down 18% on 2015/16 at 2,300 tonnes due to the anticipated lower production. Consumption: Domestic uptake is expected to increase by 1% to 7,100 tonnes in 2016/17, from 7,000 tonnes in 2015/16. The 2014/15 consumption of orange juice remains unchanged at 6,800 tonnes. Production: Fresh oranges delivered to juice processors are currently estimated at about 53,000 tonnes annually. Consumption: The local market consumes more than 70% of the estimated overall orange juice production estimated at 50 million litres, of which 20 million litres come from local processing of fresh citrus and the rest from imported juice and concentrates. Trade: Imports for 2016/17 (September – October) are forecast to increase slightly to 4,000 tonnes and exports at 3,000 tonnes. Estimated imports for 2015/16 are 3,238 tonnes and exports are 2,946 tonnes. Trade: Costa Rica exports the majority of its orange production as frozen orange juice concentrate but also exports non-frozen juice concentrate. Exports amounted to 25,519 tonnes valued at USD37.1 million in calendar year 2015 (January-December). This compares with 29,360 tonnes valued at USD51.7 million during the same period in 2014. Data available for January-August 2016 show a significant increase in exports during 2016 reaching 34,824 tonnes valued at USD68.1 million. Higher exports during calendar year 2016 are consistent with higher production in 2015/16. The US continues to be Costa Rica’s main destination for orange juice exports. Consumption: Domestic consumption for 2016/17 is forecast to decrease by 500 tonnes, a 1% decrease compared with 2015/16. Production: The initial forecast for 2016/17 (October-September) for orange deliveries to processors is 55,000 tonnes showing strong demand against the corresponding period 2015/16 which was estimated at 26,000 tonnes. The forecast for orange juice production for the period 2016/17 is 5,500 tonnes against an estimated figure of 2,600 tonnes for the same period in 2015/16. Trade: Imports are forecast to be down year on year from 26,000 tonnes for 2016/17 against 29,000 tonnes for 2015/16. Exports are looking static for 2016/17 and 2015/16 at 14,000 tonnes and 14,400 tonnes respectively. Processing: Fresh lemon for processing in 2016/17 (November-October) is forecast to decrease on the previous year to 1.02 million tonnes. Fresh lemon for processing in 2015/16 is estimated to decrease from 1.2 million tonnes to 1.05 million tonnes. For 2014/2015, fresh lemon for processing remained unchanged at 1.195 million tonnes. Following the practice carried out in the past few years, relatively high volumes of fruit are being devoted for processing as a result of the decision made by the industry to export only fresh lemons meeting higher quality standards, thus restricting the export supply and preventing a steep decrease of international prices. Consumers complaining about the quality of a brand product or, even worse, a critical media report by a consumer organization always cause significant costs in trade. In recent years, falsely labelled products pretending superior quality, premium provenance or premium variety caused dramatic losses in consumer confidence, resulting in a loss of faith in product declarations of a large number of consumers. To guarantee the value of store products it is therefore of utmost importance to ensure their quality and authenticity. For both, raw materials and end products, magnetic resonance (MR) based ingredient profiling offers a quick and versatile way to simultaneously screen quality and authenticity, in particular when applied to fruit juice, wine, honey, edible oils and related foods. Food fraud is the modern spectre producers, retailers and entire branches of the food industry are afraid of. Scandals such as the horse-meat issue weaken consumer confidence – not only in products of single “black sheep“, but rather in much of the food industry. Thus, products with fraudulent declaration, if or when discovered, damage all participants of the value chain. Fraud identification is a very difficult task, as adulterations are in many cases performed with great care and expertise. Rare are those cases in which a single parameter identifies an adulteration. Often, an adulteration is cleverly masked by addition of a blend of ingredients. Particularly difficult to uncover is food-origin laundry, that is the fraudulent labelling of food with a wrong geographic location. Although numerous expensive and time-consuming analyses are often being conducted to reveal food-origin laundry, it is difficult to obtain even close to 100 % confidence. SGF (Sure-Global-Fair) Juice-Profiling (1), originally developed and now continuously maintained with support of SGF International (www.sgf.org), and BatchCheck are cost and time efficient alternatives that are based on the magnetic resonance spectra of the foodstuff to be tested. SGF Juice-Profiling relies on a single quick measurement that allows it to quantitatively assess numerous ingredients. Magnetic resonance spectroscopy has a unique dynamic range and high resolution, rendering simultaneous quantification of dozens of substances possible at very high and very low concentrations within a short measurement. Very simple sample preparation adds to robustness and reproducibility of the method. For instance, this juice profiling method allows a quick estimate of the concentrations of sugars, organic acids and amino acids, replacing costly and time-consuming traditional analyses and allowing the comparison of the spectral fingerprint with a database of thousands of authentic samples. Thus, fruit type, geographic origin, fruit content and even unexpected and yet unknown adulterations can be quickly screened. Even if the results from the juice profiling were not perfectly conclusive, usually based on the composition an efficient and inexpensive route for additional analysis – if needed at all – can be delineated of the basis of the profiling results. At present, SGF Juice-Profiling is available for more than 30 fruit types and delivers up to 37 quantitative results in addition to authenticity testing (fruit dependent). Adulteration frequently occurs along the trade-chain. Consequently, merchandise samples and delivered batch are not always identical. 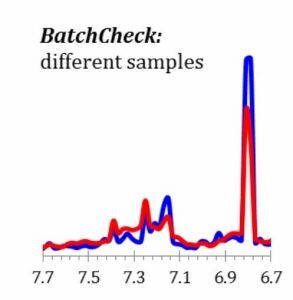 BatchCheck takes advantage of the high resolution and the unmatched reproducibility of magnetic resonance spectroscopy regarding quantitative information. The procedure relies on the comparison of the quantitative spectral fingerprints of the merchandise sample and a sample drawn from the delivered batch. 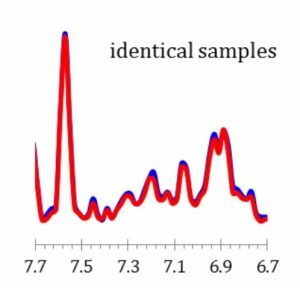 By contrast to, e.g., stable isotope methods, where typically a handful of parameters are used for such comparisons, BatchCheck utilizes several hundreds of signals available from the magnetic resonance spectrum (Figure 1). Using statistical methods fingerprints of the merchandise sample and the batch that was finally sold are compared in back-to-back measurements with highest sensitivity in the shortest possible time. In the case of deviations of the two samples that are being compared, combined with the quantitative evaluation available from SGF Juice-Profiling can aid identification of deliberate adulteration, dilution or quality defects resulting from inappropriate storage before, during or after transportation. Today, magnetic resonance based profiling tests are routinely applied for quality and authenticity screening of fruit juices, wines and honey. Applications include testing of raw materials as well as finalized and packaged products. The method is applied by the private sector as well as governmental agencies. Utilization of a centralized ISO 17025 accredited evaluation method in combination with the outstanding reproducibility of the magnetic resonance technology, maximum comparability and reproducibility of results is ensured. SGF Juice-Profiling has been applied for over 10 years in the market. The Honey-Profiling (2,3) module that was added recently expands the capabilities of the profiling method. With this newly available module it is possible to quickly screen for adulteration of honey, an important ingredient for many fruit juices. Hence, magnetic resonance based profiling offers significant advantages for time and cost savings in production, and can make an important contribution to regain lost consumer confidence. Figure 1: ALNuMed’s BatchCheck relies on the quantitative information of hundreds of signals available from a magnetic resonance ingredient fingerprint. In the above, two expansions of such ingredient fingerprints are shown (10 % of total fingerprint; magnetic resonance scale in ppm [parts per million], intensity scale in arbitrary units). The right panel shows fingerprint traces from two different batches of a fruit puree, while the left panel depicts ingredient fingerprints of two samples of the same batch. It can clearly be seen that the fingerprints of samples from different production batches differ significantly – despite resembling the same fruit type. By contrast, the fingerprints of the same sample depicted in the right panel are essentially identical. The region selected typically shows signals of phenolic substances, which are present at comparatively low concentrations. Of note, from the same measurement magnetic resonance allows quantification of ingredients present at much higher concentrations, including sugars and organic acids. The resulting quantitative fingerprint differs in quality and reproducibility form other available technologies and even allows testing for fruit variety, dilution, and geographic origin of the fruit with SGF Juice-Profiling.